MYERSTOWN, Pa. (June 12, 2018) – Capping off an impressive stretch of World of Outlaws Craftsman Sprint Car Series competition that included one victory and three consecutive top-five finishes, the “Myerstown Missile” Brent Marks made the most of his recent visit to Fairbury (Ill.) American Legion Speedway on Tuesday evening, June 5, not only securing his third top-five finish in three starts, but doing so from the outside of row seven. Marks, driver of the Brent Marks Racing/M&M Painting & Construction/BAPS Auto Paint & Supply/Eagle Hotel/No. 19 sprint car, started 14th and drove to fifth at Fairbury, actually battling as high as fourth in the running order during certain segments of the main event. The second-year Outlaw traveler secured his place in the main event by finishing fifth during his respective heat race. Unfortunately, Marks was unable to continue his top-five streak during competition at Jackson Motorplex on June 7-9, highlighting his three-day turned two-day campaign at the 40th Annual Jackson Nationals with a 15th place finish during the $40,000-to-win finale on Saturday evening, June 9. Brent Marks will continue his 2018 World of Outlaws campaign with a two-race march through North Dakota, set to visit River Cities Speedway in Grand Forks on Friday, June 15, followed by a stop at Nodak Speedway in Minot on Sunday, June 17. Marks will enter the weekend 11th in the World Of Outlaws championship standings, just 30 markers outside of the top-ten. 2018 Highlights: Earned one top-ten finish with the Arctic Cat All Star Circuit of Champions presented by Mobil 1, as well as one top-ten finish with the World of Outlaws Craftsman Sprint Car Series, each during DIRTcar Nationals action at Volusia (Fla.) Speedway Park. Charged from 25th to finish ninth at The Dirt Track at Las Vegas with the World of Outlaws on February 28 – KSE Hard Charger Award. Finished tenth with the World of Outlaws at Arizona (Ariz.) Speedway on April 7. Finished tenth with World of Outlaws at Federated Auto Parts Raceway at I-55 on Saturday, April 21. I-55 finish earned Marks KSE Hard Charger Award (+12 positions). Advanced from 13th to finish ninth during Texas Outlaw Nationals finale at Devil’s Bowl Speedway (Texas). Finished seventh at Salina Highbanks Speedway in Salina, Okla., on Saturday, May 5. Earned KSE Hard Charger Award at The Dirt Track at Charlotte on Friday, May 25 – charged from 20th to finish 12th. Earned pair of top-ten finishes (eighth and ninth, respectively) during Weikert Memorial programs at Port Royal Speedway. 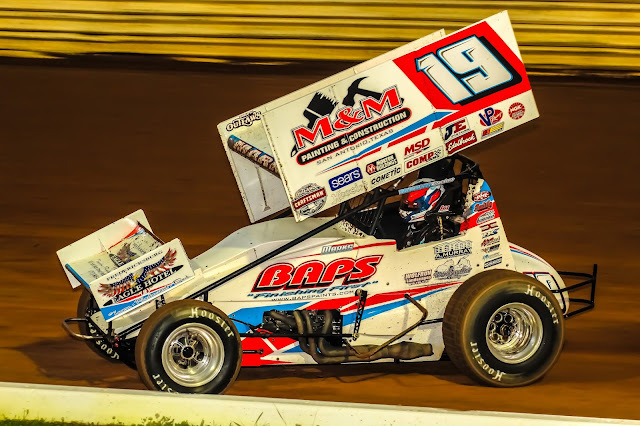 Earns back-to-back World of Outlaws top-five finishes during action at I-96 (Mich.) Speedway and Wilmot (Wis.) Raceway on June 1-2; won at Wilmot Raceway for first-ever WoO victory. Earned third consecutive WoO top-ten during action at Fairbury (Ill.) American Legion Speedway on Tuesday, June 5.